More than 3300 riders from all over the world took to the roads of Wicklow today for the 37th running of the Wicklow 200. Ireland’s longest running mass participation bike ride, organised by the IVCA, attracted another record breaking entry to face one of the toughest challenges in Irish sport. Riders of all ages taking part in the full 200km Wicklow 200 event and the Wicklow 100 Challenge sister event faced numerous hills and other difficulties but the weather was not among them. The 2018 edition of the event, which first began in 1982, was one of the warmest and sunniest on record. Among the longest journeys to the event was made by inspirational US pensioner Robert Rice. The Arizona native was travelling through Ireland on a bus tour last year when his party encountered large groups of cyclists in Wicklow. The bus driver explained that he was looking at riders in the Wicklow 200 and Rice made the decision there and then to travel back to Ireland with his bike for the next edition. 12 months on Rice duly completed the 200km without significant issue and afterwards declared the day a complete success. Wicklow 200 is a celebration of road cycling for all as riders of all ages and levels of ability challenge themselves on a variety of steeds. Martin O'Brien attracted much attention throughout the day and duly completed the event on his Cycle SuperStore prepared Kona Fat Bike. It wasn't exactly the obvious bike for a 200km road event and O'Brien drew a crowd at every water stop with his mountain bike which proved no hindrance to his enjoyment of the day. Rice and O'Brien were just two of the riders celebrating at the end of a stellar day on the bike and the event organisers IVCA were also satisfied at the conclusion of another successful edition of Ireland's favourite bike ride. The riders were supported throughout the day by an army of more than 250 volunteers from the IVCA. The final finishers in the Wicklow 200 arriving back at Bray Emmets GAA Club just before 8pm, fully 13 hours after their departure on what is always a challenging day on the bike regardless of fitness levels and many, if not most, were soon making plans for the 38th edition of Wicklow 200 in June 2019. Wicklow 200, Ireland’s longest running annual challenge cycling event, has created a new initiative aimed at preserving the environment on the roads of Ireland’s Garden County. The Love It Don't Leave It campaign centres around the beauty of the surroundings the riders will be travelling through during the Wicklow 200 and its Wicklow 100 sibling on Sunday June 10th. The anti-littering campaign is asking riders to 'love Wicklow, don't leave litter' and will incentivise entrants to dispense of litter responsibly as well as introducing other initiatives aimed at acknowledging and preserving the natural beauty of Ireland’s most popular cycling destination. Wicklow’s roads have been the training ground for cycling legends and current pros alike such as Tour de France heroes Stephen Roche and Shay Elliott as well as current pros Nicolas Roche and Chis Juul-Jensen. Wicklow has also formed the backdrop for some of the most beautiful images seen in cinemas and on TV around the world. Therefore, the organisers of the Wicklow 200 have created the Love It Don't Leave It campaign aimed at educating and encouraging riders to enjoy their surroundings without environmental impact. On the day, riders can exchange gel wrappers and energy bar wrappers at the finish line for tickets in a prize draw. In addition, the organisers have made a commitment to reduce plastic waste by using water tanks to refill the riders’ water bottles at the feed stations in Baltinglass and Rathdrum. The organisers will also keep plastic food packaging to a minimum by ensuring that cakes and savoury items are not individually wrapped for dispensing at the feed stations and the finish line. The Wicklow 200 organisers believe that the roads and landscape they travel through give so much to cyclists and it's our responsibility to give something back to the countryside. An extensive #LoveItDontLeaveIt media campaign will keep the aims of the initiative at the forefront of minds in the run up to the event. Event organiser Alan Heary believes that the Love It Don't Leave It initiative is a key component in getting the most out of the Wicklow 200 experience for riders and organisers alike. “For everyone involved in Wicklow 200, the event is a privilege and it’s up to us to recognise our good fortune by returning the compliment. “The Love It Don't Leave It initiative is our way of showing the world that cycling in Ireland’s most beautiful county is an honour and we’re asking our riders to acknowledge that by retaining their litter to be disposed of in the proper way. “The water tanks will dramatically reduce the amount of plastic waste the event generates and the packaging needs have also been cut by not individually wrapping each food item in plastic as was the custom in past years. 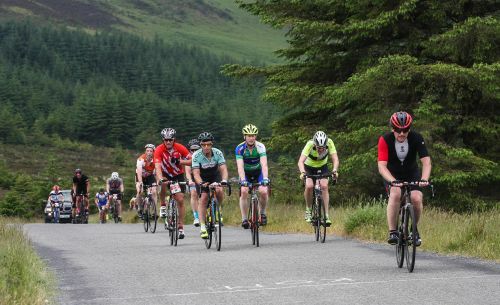 The Wicklow 200 is a non-competitive one-day cycle ride that takes place every June and attracts over 3000 cyclists from many different countries. Established in 1982 by the Irish Veteran Cyclist Association (I.V.C.A, the Wicklow 200, as the name suggests, covers over 200 kilometres around Co. Wicklow, taking in most of the famous hills that have made Wicklow a major international cycling destination over the years. The Wicklow 200 serves as a major fundraising event for cycling in Ireland. Approximately 250 volunteers provide first aid, mechanical breakdown, route marshalling, car parking, changing rooms, showers, and refreshment stops. THE 2018 EVENT TAKES PLACE ON JUNE 10.